The rainbow trout (Oncorhynchus mykiss) is a species of salmonid native to tributaries of the Pacific Ocean in Asia and North America. 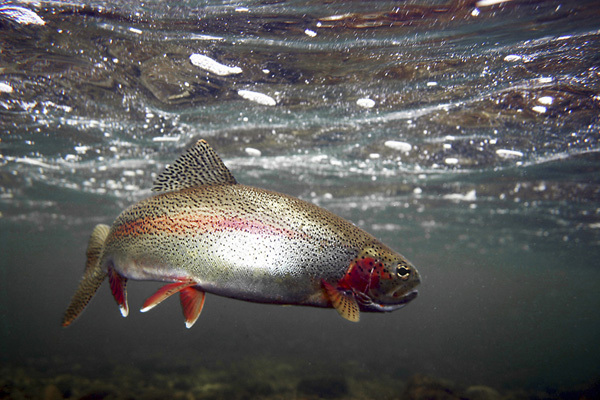 The steelhead is a sea-run rainbow trout (anadromous) usually returning to freshwater to spawn after two to three years at sea; rainbow trout and steelhead trout are the same species. The fish are often called salmon trout. Several other fish in the salmonid family are called trout, some are anadromous like salmon, whereas others are resident in freshwater only. The species has been introduced for food or sport to at least 45 countries, and every continent except Antarctica. In some locations, such as Southern Europe, Australia and South America, they have negatively impacted upland native fish species, either by eating them, outcompeting them, transmitting contagious diseases, (such as whirling disease transmitted by Tubifex) or hybridization with closely related species and subspecies that are native to western North America. Northern areas of Pakistan are blessed with towering mountains, mighty lakes, cultural heritages and roaring glacial rivers. Trout in specific, is a species of cold waters. This is the reason that the rivers and lakes of north are blessed with abundance of this species of fish. An interesting fact regarding the fish is that it needs temperatures around freezing point to breed and live in water. If the outside temperature goes above 55 degree Fahrenheit, it tends to die. Trout is now considered a delicacy and tourists visiting northern areas are keen to have a taste of this cold water species. But now in most of the areas, trout is only limited to Farms and its really hard to find natural water trouts in restaurants. There used to be an abundance of Trout in the famous rivers of Kunhar, Ushu, Utror, Kargah and northern part of river Indus. But now this is in limited areas and numbers. Dozens of high altitude lakes of Northern Pakistan, which are rarely visited by tourists, have trout in abundance. But if you are interested in fishing, a day’s permit is available for fishing with a rod and you can fish in the mighty Kukush lake, Handrap lake, Phandar lake and the northern parts of Kargah stream in Gilgit Baltistan. In Swat, Kumrat’s Panjkora river is also blessed with abundance of the fish. In kaghan valley, small individuals may also be found in Dudipatsar and Lulusar lake but fishing is mostly prohibited.